Auctioned on eBay in July 2004. The item has to be 100% unique, I have had it checked with Reckless Records in central London, they have not seen another example in decades of business. The record is a 10" acetate recording of the 1969 Beatles Fan Club Christmas record. The disc would have been produced during production the prior to pressing the Christmas flexi discs in 1969. It would have been given to the sound engineer or somebody working in the studio, as a keepsake. The recording was mixed by DJ Kenny Everett, who also did some of the other Christmas records. The label (see photo) features a green and white apple logo, this would be the same design as the Hey Jude and Get Back demo recordings. 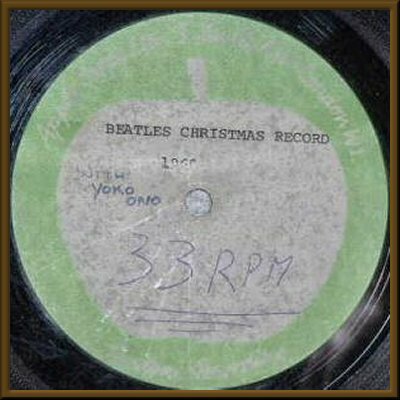 The label states "Apple Corps Ltd. Savile Row London W1" & "Custom Recording" Type written on the label is "Beatles Christmas Record 1969" and handrwiting "WITH YOKO ONO" & "33 RPM". The photo does not do justice to the label, the typing particularly is much clearer than indicated in the photo. 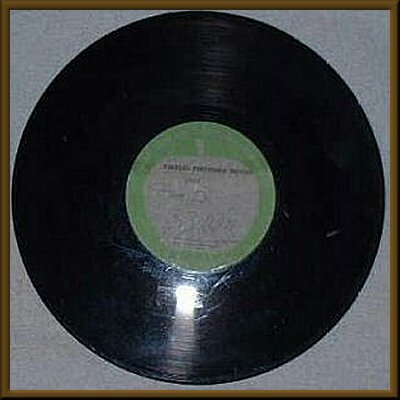 I have played the record through to check quality, it has some surface marks but does not skip. It has a slight scrape on the edge of the disc (not the playing surface it is only visible by scanning the edge). The item is 100% genuine, I would not sell it if it was not. Don't miss out on the opportunity to own a unique Beatles item. There is no specific documentation for the recording history of the recordings found on this disc. Each of The Beatles recorded their own bits seperately presumably at their homes. The personal recordings were then edited an produced by UK radio personality Kenny Everett. Recording and production apparently occurred in late November - early December 1969. George Martin took no part in this 1969 Christmas recording. NOTE: the auction description does not state whether or not this recording the same edit as was featured on the flexi-disc sent to The Beatles' Fan Club member in 1969.